In a medium bowl, cover cashews with warm water and let soak for 30 minutes. Drain and rinse, then transfer them to a blender. Add 6 tablespoons water, nutritional yeast, lime juice, and salt and blend on high speed until smooth. Set aside. Meanwhile, in a medium saucepan combine rice and 3 cups water. Bring to a boil, cover, reduce heat to medium-low, and simmer until tender, about 30 minutes. Remove from the heat and set aside. For the salsa, in a medium bowl combine mango, avocado, pepper, garlic, lime juice, and salt. Set aside. Lay out tortillas on a work surface. 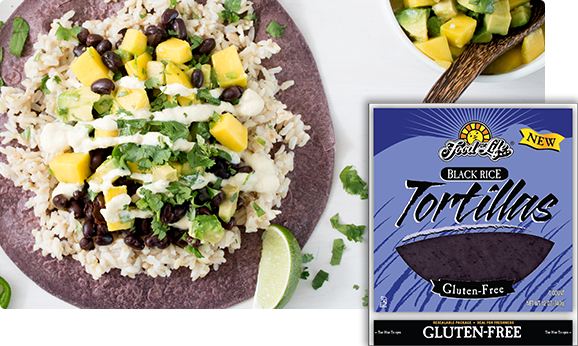 Divide rice between them, then top with black beans and mango salsa. Fold in sides of tortilla then roll up to enclose filling. Serve with crema.